One of the true joys of summer is the dinner picnic. Gather some friends, a blanket, a bottle of wine, and someplace to spread your spread. Ideally grass will be involved, and enough live music to add to the ambience without inhibiting conversation. Bread and cheese is always a classic dinner picnic meal, but really, what’s the fun in that? I can spend a week planning a good dinner picnic. Nothing that needs to hold to a certain temperature, or is too fragile to be packaged. My husband always tells me to keep it simple, but I suspect his idea of simple and mine aren’t exactly the same thing. On a recent summer picnic (accompanied by 20’s jazz in a botanical garden), I kept it simple. Potato chips and onion dip ( for the nostalgia factor), grilled pork tenderloin that had been marinated with some southeast Asian ingredients, a light coleslaw with pineapple, and this tropical trifle. 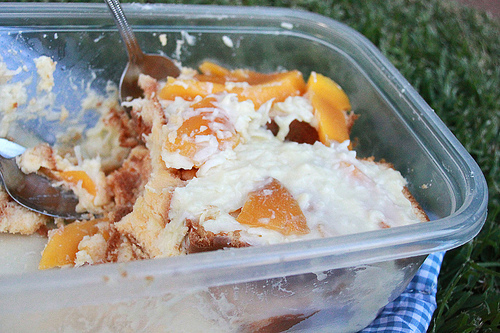 I love trifle because it’s so unexpected at a picnic, but it really is ideal. It can (should) be made in advance, and is supposed to be made in a large bowl, which translates easily into a Tupperware container. You can scoop it out onto paper plates, or just offer everyone a spoon and have them dig in. And it has booze, which is always a plus. This trifle (which was inspired by a query from my friend Rebecca, who was looking for a tropical themed dessert to take to an outdoor production of the Tempest) is a variation on my family’s trifle. We always used Sara Lee pound cake, and it works beautifully, but I suppose you can make your own. Do make your own custard though. The one, made with 2% milk and whole eggs instead of cream and egg yolks, is not too rich and not too sweet. Assembly is quick, once the custard is made, but do allow some time for the flavors to marry in the refrigerator. And don’t worry about beauty. Trifle is about how it tastes. In a heavy, nonreactive 2 qt saucepan, heat the milk to a simmer. While the milk is heating, whisk the eggs and sugar together with the salt. Reduce heat to very low, whisk about half of the hot milk into the egg mixture, then dump the egg, milk and sugar mixture into the pot with the remainder of the milk. Add ⅓ cup coconut. Cook over very low heat, stirring constantly. You don't want the eggs to "curdle" which basically means scramble, but very low heat and constant stirring should help. After about 2 minutes, combine some of the custard mixture with the cornstarch and stir together until no lumps remain. Add to the rest of the custard mixture, and keep cooking and stirring until it stops being milk and turns into custard, or until it coats the back of the spoon. You'll know. It's supposed to be still runny. Add the remaining coconut and the vanilla and stir together. Chill in the refrigerator. 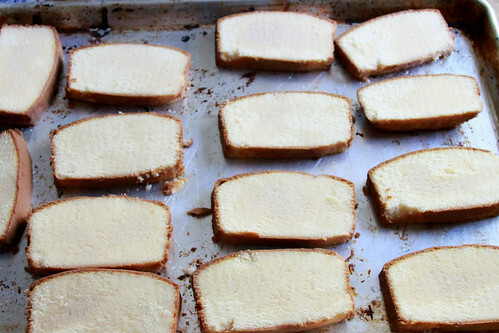 Slice the pound cake and set it on a rimmed cookie sheet. Sprinkle the rum over the poundcake slices (they should be damp but not soaked. Use more or less rum as you feel like it. Peel and slice the mango. (I realize this is impossible to do neatly. Random sizes are fine here, but I'd go with slices over chunks for layering purposes). In a tupperware container (or a bowl), layer the rum soaked pound cake, the mango slices, and the custard, finishing with the custard.